As we hoped, we were all (plants and people alike) able to savor the sunshine and feel secure knowing summer is here in these last few days of June. You’ll see more variety in this week’s harvest! Welcome kohlrabi! We have collected some cooking & eating ideas here Remember that there is a list of produce on the right hand side – click to find ways to prep and enjoy! If you have a recipe you want us to include please send an email! 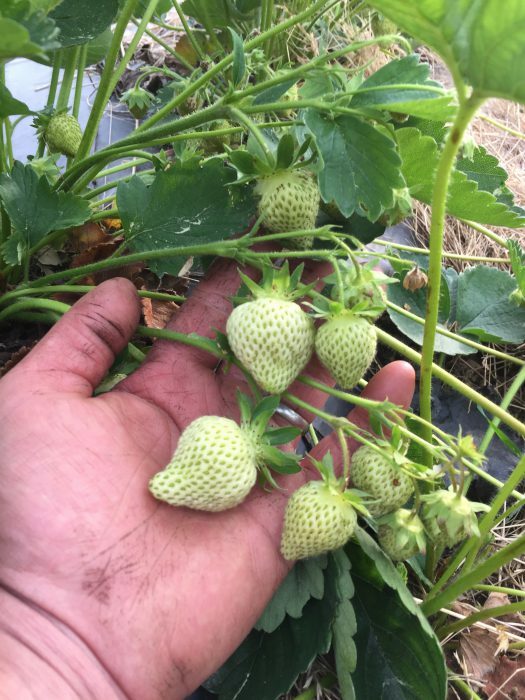 We also happily welcome the arrival of strawberries this week in the Upic field – we’ll give you guidance on harvest size when you arrive. The news from the farm is short and sweet this week…Seth is graciously traveling this week with Griffin and 93 other 8th graders to our nation’s capital and every single place in between, and Maura is, thanks to our abundance of snow days, still at working at school. Our strong, caring, amazing crew has been keeping everything moving along steadily! Fourth of July is on a Tuesday Pick-up will be Wednesday July 5th! Since many of you will be in a hammock, an inner-tube, or the other side of a grill on the afternoon of Tuesday the 4th, we will move the pick-up to Wednesday (July 5th) 2:00-7:00 p.m. See you there! Add on shares (bread, cheese, yogurt, mushrooms, beautiful flower bouquets) have started last week, but you can still sign up. If you’d like to sign on for a weekly share (or any of the add-on shares), follow this link. Talk to (or email) Maura about pro-rating the costs of the add-on share. Fresh Fish Delivered to Farm on Fridays! The weather is improving, crops look great and in a couple weeks the plants will catch up with the calendar. First on this list is strawberries. If we get some heat they could be ripe next week, if it is cold they may take another (this is a solid two weeks behind our usual date). Zucchini, cabbage and kohlrabi are doing their best and will be sizing up soon. Tomatoes and peppers are enjoying the protection of our field greenhouses and have no idea what all the fuss about cold and wet is. Add-on Shares Start this Week! Want to sign-up but haven’t yet? 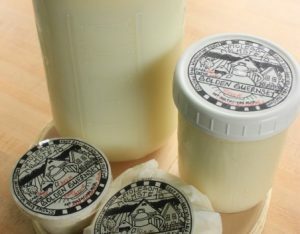 Eggs, mushrooms, cheese, flowers, bread, and yogurt shares are available. Sign up online and we will add you to the list. Second year apprentice and assistant manager Virginia has created the flower bouquet share this season. She has put together a dizzying asortment of rare and exceptional varieties all grown in our dedicated kitchen garden by the farmhouse. 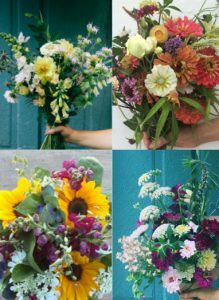 Each week she will be harvesting and arranging bouquets for the share (and a few to sell as well). If you’d like to sign on for a weekly share (or any of the add-on shares), follow this link. Plants, like people, take time to adjust to change. After the extended spring that just ended on Saturday our crops are doing their best to get with the new season. Unlike us they don’t have the option of taking a break in the shade with a cool drink but instead must buck up and make the best of it. Peppers, tomatoes and zucchini are up for the task; lettuce, broccoli and cabbage need to protest a bit by wilting and looking sad for a few days. Eventually everyone is on board but what this means for all of us is that we need to be patient. This is a long winded way of saying we have a good but less diverse harvest for you this week. Thankfully we put many hundreds of pounds of beet in the cooler last fall and will be able to share these with you this week in addition to some greens. Add-on Shares Start Next Week: There is Still Time to Sign Up! Egg, Bread, Cheese, Mushroom, Cheese, Yogurt and Flower Bouquet shares will start next week which means there is still time to make your weekly farm produce that much more complete. Here’s the link to look at what we have to offer for add-on’s. 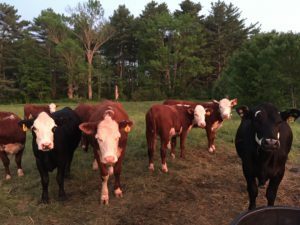 In addition to our ever popular piglets we also have 11 heifers (young cows that have not borne calves) who are doing their level best to graze back the pastures along the CSA parking lot. On loan from our friends at Old Crow Ranch they will be with us for the next month or two. Old Crow separates their steers (young males) from the heifers to give the girls a break from the pestering of the boys. These young females thrive on good grass away from the boys for the summer (think all-girls boarding school). Beyond the gender politics we are happy to have them on the farm. Take a stroll on the trail off the CSA parking lot to get a closer look. Eleven year old Leila Wraps bales in the shade. There is nothing zen about farming. Instead of being where you are at this moment the true art of agriculture is to be thinking many steps and or many days ahead of where you stand. 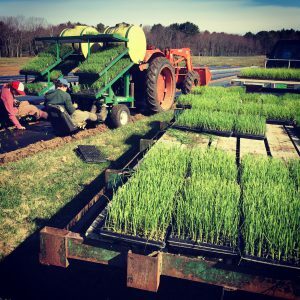 In addition to growing 140+ vegetable varieties we also grow 60 or 70 tons of grass to feed our neighbors’ animals thoughout the winter. 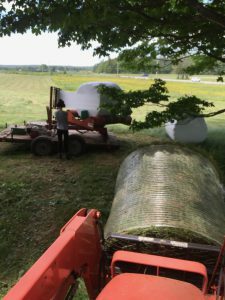 Cutting this much hay and making silage (wrapped “wet”hay that is preserved by fermentation) is nothing more than a game of timing and chance. Cutting grass and drying it down from 80% moisture to 15% moisture using only sun and wind is an absurd game that puts inordinate trust in meteorology (it takes 2 days of sun and dry), equipment (we have a 30 year old mower pulled by a 40 year old tractor that also runs our 25 year old baler) and force of will (with 93° heat this past Sunday we forgot we were in Maine). If all these planets align we can bale up 30 thousand pounds of grass in couple days. Thankfully our kids are available to fall into the workflow; wrapping bales or loading them in the barn. It’s dark. It’s cold. It’s rainy. Things are growing! Mother nature is persistent and even with the less than perfect weather of the last six weeks we are starting the CSA on schedule. That said the share is a bit light on diversity this week and most likely next as well. Please remember that the value of your CSA share comes over the course of the whole summer and that the harvests of strawberries, tomatoes, watermelon, and basil (just to name a few) will be filling your bags and boxes soon. See you this week on Tuesday or Friday from 2-7pm. For the first time in five years we are starting harvest with farm shares available. Is it the weather? Is it the news cycle? We’re not sure but we hope both change soon and that all of you will tell your friends, tell your neighbors to join us for the season. We are happy to sign up new members and prorate until we are sold out. Try out the bread, cheese and yogurt or take a look at samples of our eggs, mushrooms and flower bouquets before we start these shares the week of the 19th. Remember you can still sign up for these great additions. Follow this link. We grow carrots for a couple local restaurants and supply them through the winter. When we have a good crop there are some to share with you this time of year. These sweet roots were harvested in November and kept in our big walk-in fridge at 33° and 95% humidity through the cold months. Our new crop will start coming in by July but these taste pretty good. Our perennial herbs in the epic field had a great winter. They are exploding. (What’s their secret?) Head out to the field and cut a few to make a new salad dressing or season the carrots in this week’s share (thyme and carrots go great together). Come to the Farm Tuesday or Friday from 2-7pm next week for our first pick-up. The sun is shining today and we are underway. Look for an email Monday with a list of produce in the first share. The crew is excited to start harvest and despite the cool and wet we have some beautiful stuff for you to take home next week. New members of the farm are welcome to join us this Saturday or Sunday at 3pm for a farm tour and orientation. See the piglets, learn about the upic field and get the lowdown on the where and how of picking up your produce. If you can’t make these times we will be happy to show you around when you come for your first pick-up. Still Haven’t Signed Up? Want an Add-on Share? There is Still Time! 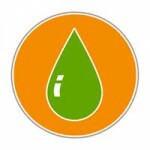 Look for the orange and green buttons on the right hand margin of this page for links. Summer has arrived we are clicking along here at the farm. Slow spring or not we are planning for another productive season. Crops from arugula to zucchini are in the ground with more filling in the fields everyday. This last week we put up our tomato tunnels and set out 850 heirloom and beefsteak plants. Sweet and hot peppers will go in soon as well as eggplant, cucumbers, our second succession of spinach and upic flowers. We have shares available for both Brunswick and our delivered CSA. If you’ve been waiting to sign up, a great time to get on board is now! Please also tell your friends about our fresh organic produce, picking flowers in the upic field, eating with the seasons, or whatever you love most about your farm share. It has been a reluctant spring. Dreary days that slow to warm have been the norm. But all of that is behind us and no matter what is happening in the turbulence of our local, state, or federal political scene you still have to eat and you might as well eat great food. Here’s the sign-up links for both Brunswick and delivered shares. It’s a bit early to make a hard prediction of our start date. As always we plan and plant to harvest the first week of June but we will know more after another week of real growing weather. Stay Tuned…we will keep you informed of start dates via email. We have an amazing line-up of add-on shares for you this season. 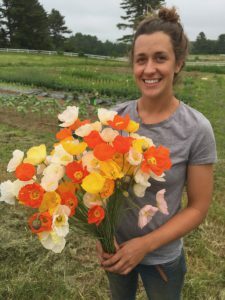 Cheese from 5 different Maine creameries, Maine-raised mushrooms, artisan bread from James Beard award winning Standard Baking, delicious farmstead yogurt, pastured organic eggs, and new this year, our on-farm flower bouquet share. In addition, Brunswick members can order fresh Maine landed fish delivered to the farm. Follow this link for more information on adding these great shares to your weekly produce. Like to watch your produce growing? 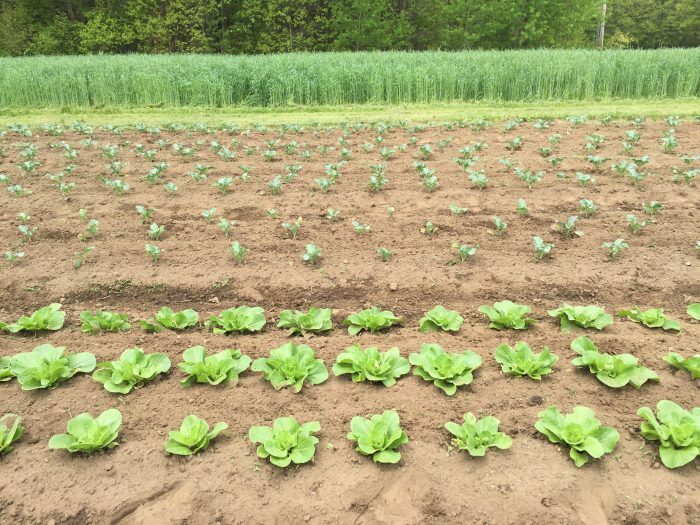 Follow us on instagram @crystalspringcsa for regular photo posts of what we are up to and beautiful shots of the food that is soon to be on your table. New to the farm this year? 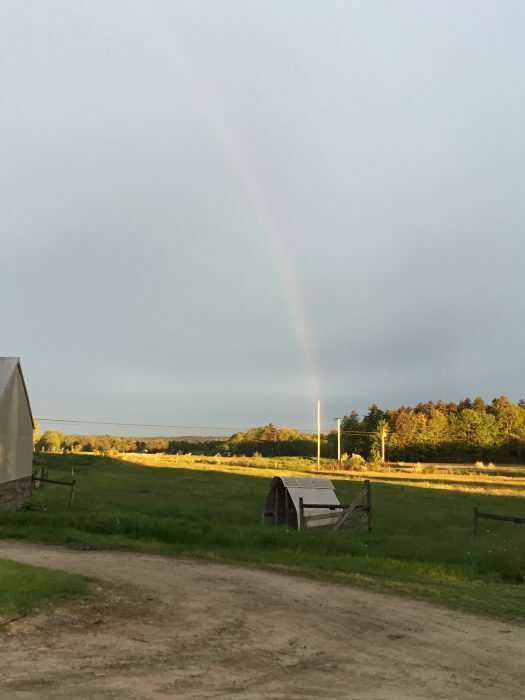 Come out to the farm on Saturday June 3rd at 3:00 p.m. or Sunday June 4th at 3:00 p.m. to meet the farmers, see the lay of the land, and learn the ins and outs of being a member. See some behind the scenes stuff and best of all meet our new piglets! Don’t worry if you can’t make one of these times, we are happy to show you the ropes when you come for our first pick-up. We are fully underway! After a very slow and cold April we have been in the fields for the past few days. 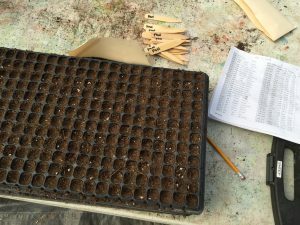 When spring doesn’t follow the schedule we get a backlog in the greenhouse as the seedlings wait to go in the ground. Last week every square foot of space was filled by plants and we were hatching plans like using mirrors to redirect sunlight on the snow still covering many fields. Luckily we were able to import some Florida weather for a few days and thaw out! 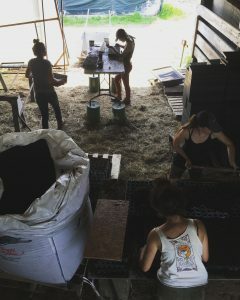 The crew has been working hard planting beets, chard, spinach, broccoli and cabbage the past few days. This time of year as the weather swings up and down planting also means covering with large fabric row covers to protect the seedlings from both temperature swings and numerous pests that emerge and have little else to eat but our tender crops. This step slows the process of planting our backlog of seedlings but Virginia, Alessia, Sarah and I have been powering through. There is nothing more exciting than trying to get a 40 by 350 foot piece of fabric to lay down in fifteen mile and hour winds at the end of the day. All in all, even with the slow release of winter’s grip this year, we are on track to begin harvesting for all of you the first week or June. 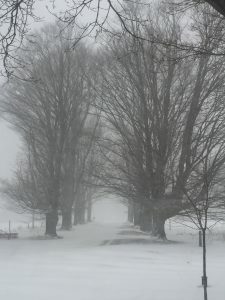 We still have both Brunswick and Portland-area delivered shares available although they have been going quickly the last week as everyone realizes winter is actually going to end this year. As always please sign up online (look for the green and orange buttons to the right of this page) where we have payment options. 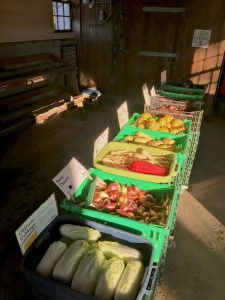 In addition to vegetable share there are also some great add-on shares to make your weekly trip to the farm or delivered box even more satisfying. These are products that we love and want to share with all of you. Here’s a list of this season’s add-ons and the farms/artisans that produce them. Sign-up for them all here! Fresh Fish: Order fresh fish weekly from Port Clyde Fisherman’s Coop and pick it up with your share. Flower Bouquet Share: New this year! Abundant Bouquets along with your produce! The best Mother’s/Father’s Day Gift! This year we are offering lush flower bouquets each week with you share. For twelve weeks from late June-September your bouquets will be cut and arranged from our dedicated flower garden (not upic). Anemones, exotic poppies, dahlias and sweet peas are just a few of the varieties. A weekly bouquet as a gift for your Mother or Father on their day will knock their socks off! 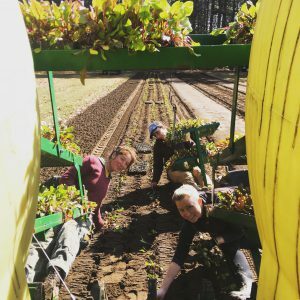 This is a starter project by dedicated crew member and second year farm apprentice Virginia. More info and sign-up here. Spring is right around the corner here at the farm. 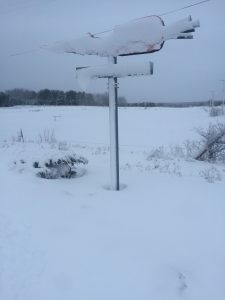 Even though the snow is falling today (heavily) it won’t stay around for too long and in no time the plants in the greenhouse will be out in the field and the season will be underway. As the farm comes out of its quiet season we have lots to talk about. Thanks for all of the sign-ups for 2017 so far. Our new online payment system has worked like a charm with both full payments and the payment plan. If you haven’t signed up yet click here. As always you have the option of paying online or sending us a check. Our 2017 add-on shares are now available for sign up. Eggs, yogurt, bread, mushroom and cheese are all listed and look for a note in the next week about flower bouquet shares as well. These shares are an easy way to add unique and outstanding products from our local farm/artisan friends to your weekly share. Follow this link for more info and to sign-up. We have partnered with a fisherman’ cooperative to offer fresh fish picked up at the farm every Friday. Starting in June you can preorder from their long list of ground fish (plus crab and shrimp) and take home you catch with your produce. Order whenever you like and pay each time right on their website. Fish will be delivered on Fridays by 3pm. Here’s a link where you can sign-up for a weekly email listing what they are landing and how to pay. Once the sun melts off all this new white stuff we are ready to kick into high gear. As always our first task outside is turning over ground from late last season, adding fertility (either with compost or organic fertilizer) and forming up new beds. By burying last years debris and turning up dark aerated soil help the ground warm faster, which is the only thing I use as a gauge as to when to start planting. Soil temperatures have become my touchstone in this new age of hyper-changable weather. I liken this standard to swimming in Maine. It doesn’t matter if the air temp is 80 degrees June 1st, the water will quickly make you hypothermic at 38 degrees. The plants feel the same way (and they don’t have the luxury of getting out!). Many damaged or lost crops in the spring have come from planting when its warm outside but not under our feet. First in the ground are peas (40°) then onions (45°), broccoli/cabbbage (50°), greens (50°), tomatoes/cucumbers (60°) and lastly the very sensitive peppers/melon (65°). For now though winter is still here. It was slow to arrive this year but I have to say I’m happy to have a bit of snow and some cold to force me out of the fields and inside. For most of the year the office is a pit stop between pressing tasks outside. But when the blizzards start I can get deep with tying things up like making budgets, tax prep and general organization. 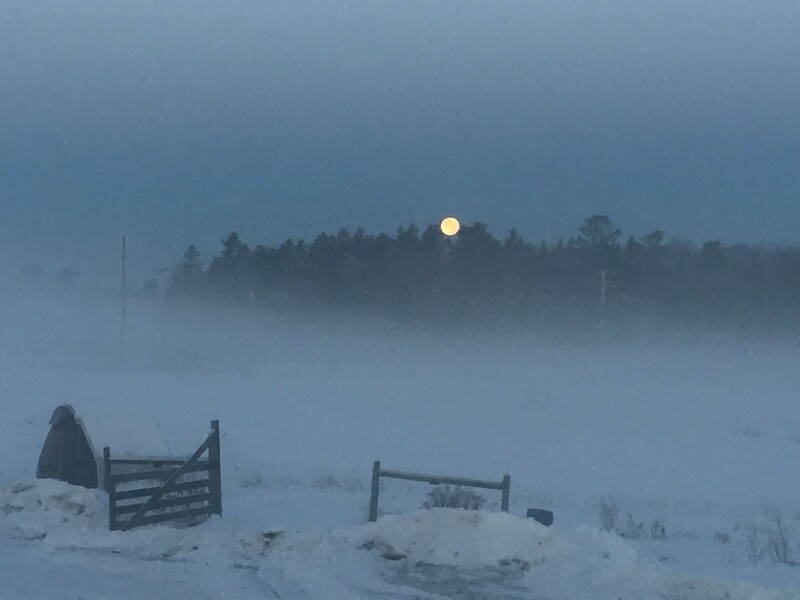 Before the snow started in earnest Kristin and I were able to spend many days in the barns cleaning and sorting everything from bolts to tractor manuals, rebuilding the systems of organization that slide towards chaos over the season. Once things are organized it allows me to work on a new project or two before we hit the fields next month. 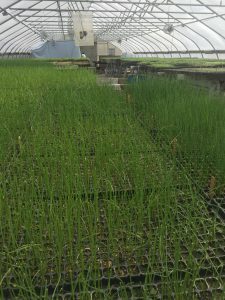 For many years we have needed a better system to germinate seeds that do best with higher temps than we run in the greenhouse. Heat mats have been the solution but they dry out the soil in our soil flats and ultimately heat unevenly. Last year we had a double door reach-in freezer die and instead of sending it to the recycler I kept it, knowing it had a greater purpose. 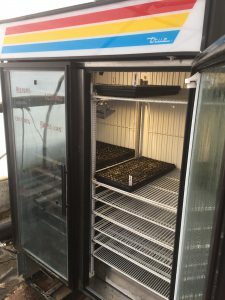 These freezers are super insulated and humidity tight- a perfect place to germinate seeds. After I had the refrigerant drained from the system I pulled out the compressor, evaporator and lots of associated wiring, leaving me with a metal box full of shelves. A friend welds aluminum so I had him make me a watertight pan to fit on the floor of the freezer and I added a water heater element wired to a waterproof thermostat. Once the pan was filled with water the element heats it up and maintains the temp that the thermostat is set to inside the cooler. Since the heat is made from warming water the chamber runs at about 99% humidity, which is perfect for seeds in flats. I added a few waterproof led lights and our first round of leeks germinated almost perfectly in just 4 days. 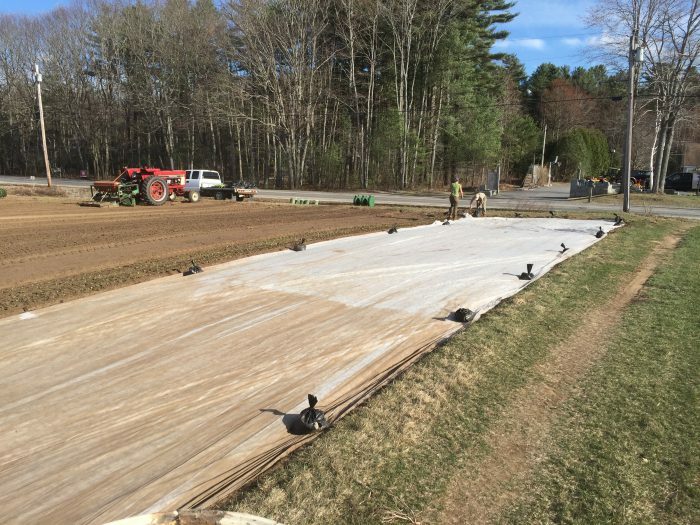 Many more projects like a composting toilet, road repair and hay equipment service are just a few to squeeze in before March comes to an end. Stay warm, find your optimism and enjoy the strengthening sun (it will be back tomorrow).